Paolo Tiralongo (Astana) won stage nine of the Giro d’Italia thanks to a strong attack after spending much of the day in a large breakaway group. Further back, the battle for the overall once again came down to Richie Porte (Team Sky), Fabio Aru (Astana) and Alberto Contador (Tinkoff-Saxo) who rode together almost to the line, where Aru proved the strongest in the sprint to recover a second on Contador’s GC lead. Ahead of the small pink jersey group that was battling for the overall, Tiralongo rode out of the breakaway group and made the bridge to Tom-Jelte Slagter (Cannondale-Garmin), who had been away solo for much of the day. When Tiralongo caught Slagter they initially rode together. This entente cordiale was short lived, however, when Tiralongo simply rode the Dutch rider off his wheel with 4.3km to the finish and continued solo to take stage nine of the Giro d’Italia. Tiralongo was originally part of a sizeable escape group which included Slagter, Carlos Betancur (AG2R La Mondiale), Sonny Colbrelli (Bardiani-CSF), Amaël Moinard (BMC), Kenny Elissonde (FDJ), José Herrada Lopez (Movistar), Ryder Hesjedal (Cannondale-Garmin), Simon Geschke (Giant-Alpecin), Maxim Belkov (Katusha), Steven Kruijswijk (LottoNL-Jumbo). Slagter was the first to attack from the group and soon had a lead of nearly two minutes over the remainder of the breakaway. His move allowed 2012 Giro champion Ryder Hesjedal to sit on the group and preserve as much energy as possible, but the counter move from the Canadian never materialised. With 15km to go the chasing group began attacking each other, in advance of the final climb. This cat and mouse meant that Slagter’s lead increased, whilst the main peloton began to close in on the chasing group. Tiralongo looked strongest and was particularly active in launching attacks. With 13.7km left in the stage he managed to go clear of the other escapees. Back in the GC battle, Aru was the first to strike out as he rode away from the peloton with 12.9km to go. 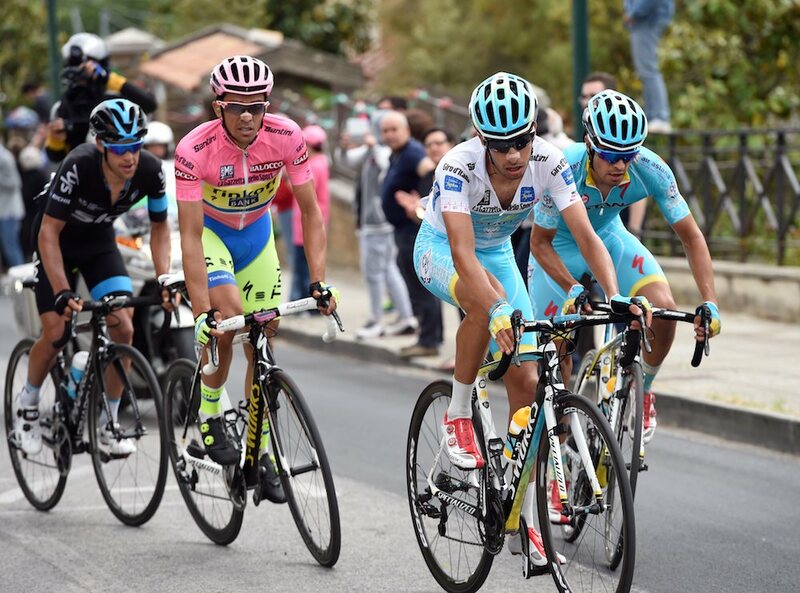 Alberto Contador and Porte were alive to the danger but left behind their teammates as they chased onto the young Italian’s wheel. Aru’s domestique Mikel Landa completed the quartet, which put Astana in control as the climb continued. Whilst the GC contenders were marking each other, Tiralongo pushed on and set himself up for stage honours. Kruijswijk broke the chasing group and was within sight of Tiralongo but it was too little too late as the Astana rider celebrated his win. Geschke came over the line for third on the stage. As the GC group headed for the finish, it was again Aru who launched first and his attack resulted in him taking back a second from Contador on the overall. Porte chased on and followed Contador over the line. Monday is the Giro’s first rest day, with battle restarting on Tuesday with a flat 195km stage from Civitanova Marche to Forli.